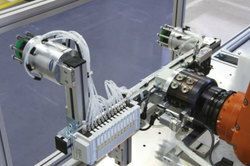 Vacuum components enable the safe and efficient handling of work pieces in automated processes. In particular, they find regular use in connection with robotics applications and automated gateways. Through the use of vacuum technology, decisive increases in productivity are gained in industries such as sheet metal, automotive, wood, packaging, synthetics, solar, electronics, or CD/DVD. The great variety of work pieces which can be handled using vacuum extends from sensitive small parts such as electronic components, solar wafers or CDs to paperboard and blister packaging, and all the way to furniture parts, heavy sheet metals or glass. The Schmalz vacuum component product program range includes everything you need to build a fully operational vacuum system. When handling CDs and DVDs it is important to gently grip the surface while reaching the required holding force with a small suction surface. 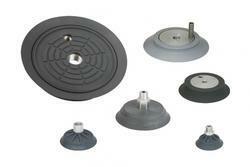 Suction cups of these series available in different shapes and materials meet these requirements. Suction cups are used as flat suction cups, bellows suction cups, in closed ring shape and semi ring-shaped in every process of CD/DVD production. 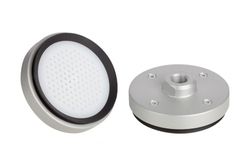 Suction cups and suction plates for handling flat, smooth workpieces such as glass which depend on high lateral forces. 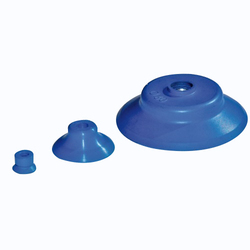 Bellow suction cups for gentle handling of, for example, automotive glass as well as handling of visible parts made of glass while leaving few marks. 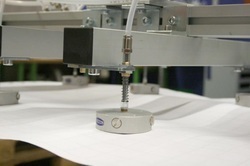 Handling Sheet Metal Suction Cupsalso with oily surfaces, handling blanks when unstacking as well as sheet metal parts with convex surfaces. Maximum absorption of lateral forces, oil resistance, and wear-resistant in highly dynamic processes. Schmalz has developed suction cups to handle workpieces at high temperatures that are perfect for this task. The suction plates can withstand temperatures up to 600 DegreeC and can be used for handling when tempering float glass and during the heat forming process of metal. 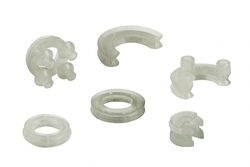 These suction cups are characterized by a robust body and a soft sealing lip that molds to the shape of the packaging. 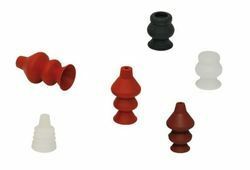 The suction cups in the packaging industry are either made of the wear-resistant materials Elastodur and PVC or silicone, meeting FDA guidelines. 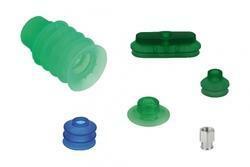 This means these suction cups can be used for handling primary as well as secondary packaging. Suction cups for wood handling are particularly suited for handling of workpieces in wood processing, such as furniture parts, floorboards or even particle board. Suction cups can be used to safely move rough, lightly structured as well as porous workpieces. For more flexibility in automated production environments, Schmalz has developed the Suction Cup Balance SSCB A gripping and clamping system with automated conversion capability for 3D mould surfaces. With the same system, workpieces of different contours can be gripped and clamped - a great advantage in the automotive industry. The Suction Cup Balance SSCB avoids expensive and lengthy conversion times It adapts flexibly to different and complex shaped components. This allows for smaller lot sizes to be produced in an economical manner. The system consists of a sturdy aluminium body with a vacuum and several compressed air connections. A flexible bellows suction pad from the resistant Vulkollan polyurethane elastomer is used in order to grip the workpiece. Around it, eight cylindrical positioning pins are arranged with wear-resistant bearing material for optimum adaptation to the respective 3D geometries. Looking for Suction Cups ?